Mark Hamill was asked by Twitter user Hannajoe Settlemyre to settle a father/son question about whether or not a Lightsaber could cut through Captain America's shield. Hamill was diplomatic about the question and seemed to take it pretty seriously. The Luke Skywalker actor weighed the options and then answered very carefully before declaring Lightsaber dominance. He explains. "In the Marvel Universe, No. In the Star Wars Universe, Luke wouldn't fight a hero, but if asked to do so, he could cut it into a million little pieces." Chris Evans caught wind of Mark Hamill's answer and disagreed right away. However, the Captain America actor didn't go into as much detail, and come to think of it, he didn't really answer the question either. Evans said, "Foolish. I now have Vibranium ninja stars." Evans didn't elaborate any further, but he seems to be insinuating that the Vibranium is superior to the Kyber crystal-powered Lightsabers in the Star Wars universe. Fans of both franchises seem to be split down the middle of this debate as well, with each fan base sticking up for their preferred characters. It's really not possible to compare a fictitious crystal from the Star Wars universe with a fictional metal from the Marvel Cinematic Universe. They both have their functions and strengths. But perhaps the main question should be whether or not a Lightsaber could take down Thanos with all of the Infinity Stones. Vibranium was no match for the Mad Titan in Infinity War, so the Avengers may want to consider asking some Jedi for help for the upcoming Avengers 4. 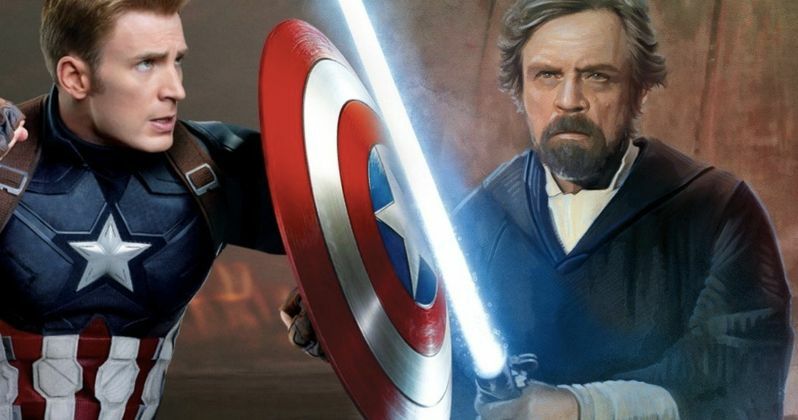 You can read the humorous debate about Vibranium and Lightsabers below, thanks to Mark Hamill's Twitter account.